One afternoon last fall I spotted something red in a tree not far from my driveway as I was in my car. This would be one of those moments, to my delight, I was thankful to have my camera with me. 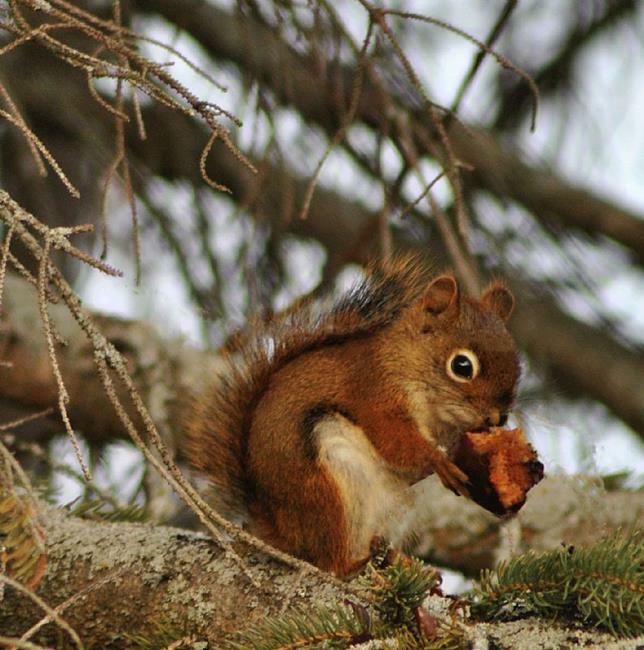 I had time to change lenses as the little red squirrel happily munched on his crab apple, most likely from a tree in my yard. I shot the squirrel from my car, then got out and continued shooting as I stepped closer and closer to the pine tree where he was sitting and watching me while he ate from the red juicy fruit. I was able to walk right to the tree before the little guy made a run for it and though I felt a little bit sad for him that I interrupted his snack, I imagine when I left he went back to get it.